Chocolate runs through our blood at Gourmandise like no other ingredient. It’s there for us in the morning on a thick slice of sourdough bread, toasted and studded with milk chocolate pieces melting atop the toast like heaven on earth, gives us a perky pickup midday, and closes with us after a long day of teaching. We love chocolate, and with our Chocolatier, Ruth Kennison’s passion and expert guidance we have plunged into a cacao wormhole to investigate, explore and experiment with responsibly sourced cacao. 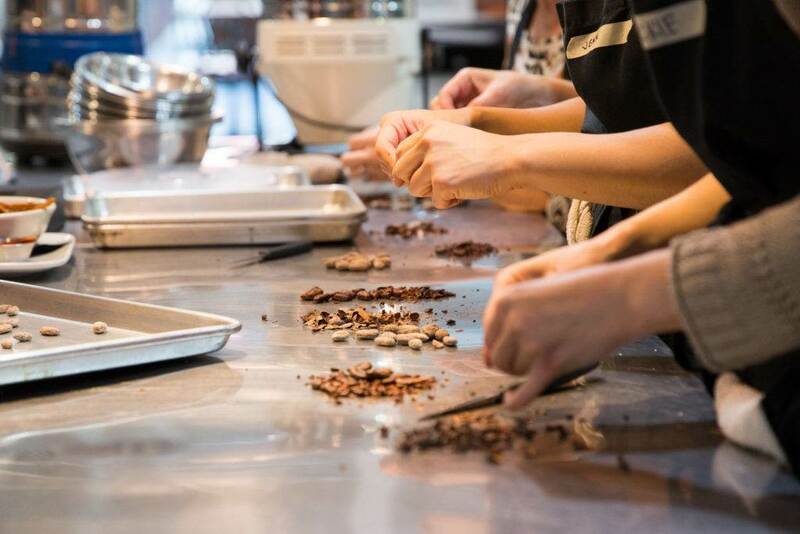 What began as a series of simple tempering classes has evolved into our Bean-to-Bar Workshop and expeditions from Ecuador to Columbia in search of all the nuances that make a perfect chocolate divine. Follow along as we explain how to buy chocolate and guide you through this world from bean-to-bar-to-palate…. Cacao and chocolate are worlds apart. Until some recent developments, nearly all the cacao beans grown in the world was shipped overseas to produce chocolate. Cacao, as we tend to call it before it is processed, will only grow 15-20 degrees north and south of the Equator. Cacao trees produce football-shaped pods that grow on the branch and trunk of the tree and are harvested with a machete and cut to reveal about three dozen kernels, arranged in a tubular pattern resembling something like an ear of corn. Once harvested, the most important part of the flavor process begins. Inside the pods, each bean is coated by a white albumen, a sort of silky white slime that varies in flavor from floral to mildly “citrusy”. The sweet pulp enveloping the beans is used to ferment them; either covered with banana leaves or stacked in wooden boxes. This process heats the beans, develops flavor and kills harmful bacteria. Fermented beans are dried in the sun and placed in large sacks, waiting to be shipped to a small number of mass producers. A chocolate maker will take beans from a wholesaler (or directly from a farmer should the chocolate be designated as Direct Trade) and turn cacao in chocolate using a few processes. The beans must first be roasted in order to separate the thin shell from the bean, develop flavor and kill bacteria. The beans are then tumbled in a winnowing machine which cracks the bean and shakes off the shell particles to separates them from the beans. The beans, now largely broken up into cocoa nibs, are then ground down into a thick paste. The paste is further processed between steel rollers for 48-72 hours. This friction, also known as conching, grinds the beans further to form a smoother liquid known as chocolate liquor (having nothing to do with alcohol). Chocolate liquor is the base for all chocolate. 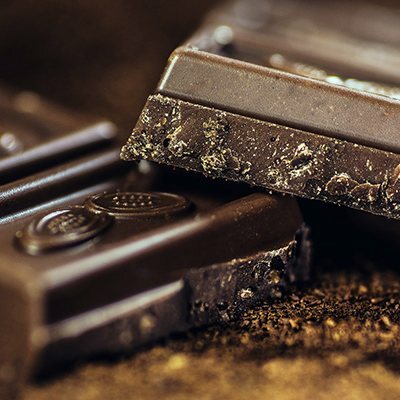 The percentage of any chocolate refers to how much chocolate liquor there is in relation to other ingredients, such as cocoa butter, sugar, vanilla and stabilizers like soy lecithin. Harvesting cocoa butter reveals a surprising fact about cocoa beans; depending on the varietal, each bean contains nearly 50% fat. 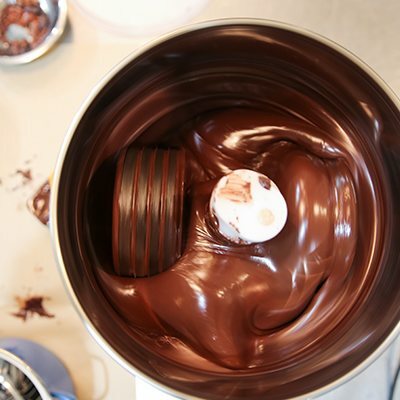 Once the beans are processed into chocolate liquor, it can be squeezed by a hydraulic press to extract the fat, or cocoa butter, leaving behind a cake of cocoa powder. Chocolatiers take a chocolate maker’s couverture chocolate (see below) and melt it down to produce ganache, cover their truffles, confections and candies and bake into specialty desserts. 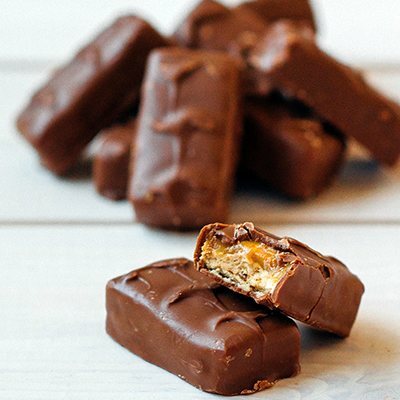 There are a few companies, (Dandelion, Choxo), who produce confections from the couverture they produce themselves, but the two skill sets of chocolate making and confection production are so different that they are rarely combined. Large scale companies, like Hershey’s, Nestle, Cadbury, Lindt, Mars and Callebaut to name a few, purchase bulk or commodity beans. 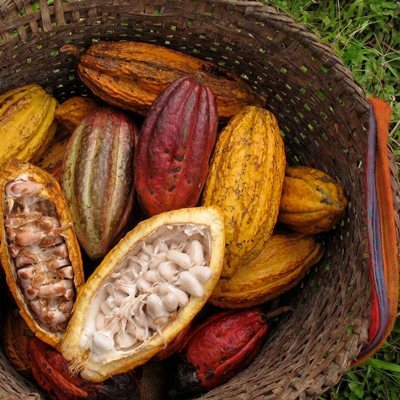 Cacao futures are bought and sold much like corn, soy and wheat on the stock exchange, with farmers’ earnings entirely dependent on the market. Farmers in Africa, for example, whose beans exchange hands up to 22 times before reaching the customer and are dependent on market prices, get paid less than $1.25 US per day. The beans exchanged on the market in this fashion are rarely high quality. There is a great divide between the grower and the chocolate maker here. Most of these beans will be used in candy-like chocolates with off flavors derived from poor quality beans and processes masked by loads of sugar and vanillin. The large majority of chocolatiers and pastry chefs are not chocolate makers but use high quality couverture chocolate to melt down and coat their confections or bake into brownies, cookies, cakes and fold into mousses. Couverture means a cover or blanket in French; these chocolates are formulated with a touch more cocoa butter to melt more evenly and smoothly, creating a thin, even coating for truffles and chocolate coated candies and melt more easily. This sort of chocolate is what you’re looking to purchase when baking anything from cakes to tempering chocolate for truffles and bon bons. The rise of bean-to-bar chocolate has opened our palates to the great variety of beans and the art and skill of proper fermentation and processing of the beans with the same fervor relegated to vinters. These two-ingredients chocolates typically contain only cocoa beans and sugar, allowing the consumer to discover the difference between fruity beans from Madagascar and the deep, earthy notes of Ecuadorian cacao. The chocolate makers producing these beans usually practice direct trade and work alongside the farmers to ensure that the beans are fermented and dried to their specifications. Craft chocolate makers who work directly with cacao farmers also eliminate many of the middlemen, thereby increasing the wages for the growers. Bean-to-bar crafters are chocolate makers. They roast, winnow, grind, conch and temper the beans and make single-origin bars for consumers to experience the differences between beans made from different countries, farms and growers. 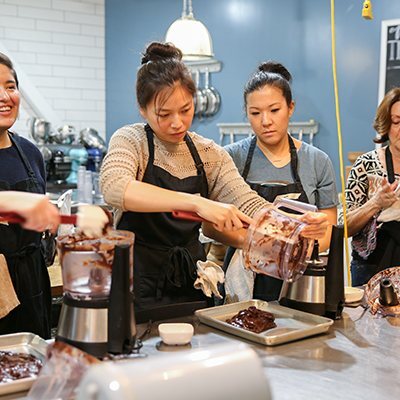 Some of the craft chocolate makers will add other ingredients that complement the varietal, from dried figs to sea salt, to make inclusion bars. Here is Chef Ruth’s list of her favorite bean-to-bar chocolate bars and where to purchase them in the LA area. You can shop online for these brands at Chocolopolis, The Meadow and A Priori Distribution. The following chocolate companies are transparent in their practices and make readily available bars. Some are delicious, some are interesting. Their taste… is up to you.